What do you get when you get a band that doesn't fit into any music category? You get 800 Octane! This Portland, Oregon base band has been around since 1995, and has made up their own music genre... "Super Rock". They play super catchy "super rock" tunes about girls, love, teenage issues and zombies! The music is super, is melodic, and will have you singing along instantly. 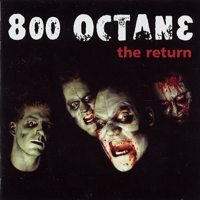 The Return is their second full length and was produced by Conrad Uno, who has also recorded artists, such as: Gas Huffer, Zeke, Groovy Ghoulies, The Supersuckers, Scared of Chaka, etc.